But now: OPCW report "fails to link any of the alleged 43 deaths to apparent chlorine found at the scene..."
The United Nations’ Organisation for the Prohibition of Chemical Weapons (OPCW) recently released their report ( https://www.opcw.org/sites/default/f...019%28e%29.pdf ) into the alleged chemical weapons attack in Douma, in the Syrian Arab Republic (SAR.) Despite having the mandate to apportion blame, the OPCW did not. Which is understandable given the evidence uncovered by their investigation. You can read a full précis of the report at the end of this article. I suggest those interested check the précis against the full report to verify my interpretation of the various OPCW statements. Al-Masdar News‏@TheArabSource · 15 hod. Last edited by goldenequity; 03-06-2019 at 06:51 AM. Steele M‏ @SteeleM35085377 · 2 min. Last edited by goldenequity; 03-07-2019 at 05:21 AM. Last edited by goldenequity; 03-07-2019 at 11:24 AM. Syrian and Russian warplanes are currently conducting airstrikes on al-Ghab Plans ... As I said, Turkey can't do anything to protect its mercenaries in Idlib. 15 minutes ago: Russian warplanes launch intensive raids on militants sites in the southern countryside of Idlib. 5 minutes ago: Air raids on Nusra sites in Kafr Rumah west of Maarat al-Numan. In response to the rocket attack on Lattakia, Russian warplanes struck HTS positions southeast of Idlib. Now a new wave of airstrikes is targeting the city center. Last edited by goldenequity; 03-13-2019 at 12:37 PM. This is just a new Israeli BS to justify their violations of the international law. Last edited by goldenequity; 03-14-2019 at 09:02 AM. More false flag ops needed. The Trump administration is doubling down on backing the White Helmets, the self-proclaimed civil defense group with often controversial activity in militant-held areas of Syria, pledging a $5 million donation at a conference. The contribution was announced by ambassador James Jeffrey, US special envoy to the anti-Islamic State (IS, formerly known as ISIS) coalition, at the third Conference on Supporting the Future of Syria and the Region, held in Brussels. The $5 million will fund both the “vital, life-saving operations” by the White Helmets and the work of the International, Impartial and Independent Mechanism (IIIM), a UN body created in late 2016 to investigate – but not prosecute – alleged atrocities in Syria after 2011. Though the Trump administration announced it would stop funding the White Helmets back in May 2018, it reversed course just a month later, sending $6.8 million to the group. (MEE) — The US military is now making plans to keep almost 1,000 troops in Syria, officials said, a shift that comes three months after President Donald Trump ordered a complete withdrawal, the Wall Street Journal reported on Sunday, citing unidentified US officials. The US now plans to keep working with Kurdish fighters in Syria, despite Turkish threats to cross the border and attack the Kurds, the US officials said. The proposal may keep as many as 1,000 American forces, spread from the north of Syria to the south, they said. Trump To Leave 1,000 Troops In Syria? What’s The Strategy? Does anyone have a source that isn't anonymous? TEHRAN (FNA)- A large number of Syrian Democratic Forces have joined the Syrian Army in Hasaka Province as the SDF has launched widespread forced recruitment of fighters in areas under its control in Eastern Syria, field sources said. "Over 200 SDF fighters have recently defected and surrendered to the Syrian Army in Hasaka province," the battlefield sources in Hasaka province reported. The sources reiterated that the Kurdish forces have forced over 1,000 young people in Hasaka to join the SDF over the past month by conducting large-scale arrests and raids in areas under their control in Raqqa, Manbij, Hasaka and Deir Ezzur. The sources pointed to people's discontent and anger from the Kurdish forces' measures, and said that a group of civilians have recently engaged in fierce clashes with the SDF members in an SDF garrison in Northern Hasaka. They came to the realization that Wahhabi Don was a false god, and became non-interventionists? Last edited by RonZeplin; 04-06-2019 at 01:02 PM. The U.S. military said Monday that it is not preventing Syrians from leaving a remote displacement camp near an American base in Syria and is urging Russia and Damascus to help facilitate the delivery of humanitarian aid.Russia has recently called for the Rukban camp near the Jordanian border to be dismantled and accused the U.S. of hindering such efforts. In the past, Russia and Syria have accused the U.S. of blocking aid delivery. Speaking in Jordan on Sunday, Russia's Foreign Minister Sergey Lavrov called the U.S. presence in the area "unlawful," saying it has "unilaterally" created "some kind of safe zone." The camp, which is surrounded by areas controlled by the Syrian government, lies within a "de-confliction zone" agreed to by the U.S. and Russia. Col. Scott Rawlinson, a spokesman for the U.S. military, said Monday that the U.S. military has stressed to the Russians the "importance" of the zone "in clear and unambiguous terms." The U.S. "expects all parties to abide by this (de-confliction) agreement," he said in an email to The Associated Press. Rawlinson said the U.S. supports efforts by the United Nations to improve conditions for the over 40,000 people housed in Rukban camp. He said their departures from the camp should be "safe, informed and voluntary." U.N. officials have said most of Rukban's residents want to leave, but fear for their security and need more safety guarantees. At least 400 camp residents left Sunday toward shelters provided by the government in central Homs province, bringing the total of those who left since March 24 to 1,660 people, according to the U.N.
On Wednesday, U.S. Secretary of State Mike Pompeo warned Turkey that any unilateral action in Syria would have “devastating consequences.” Pompeo’s comments were intended to intimidate Erdogan who stated on Tuesday that the military offensive would begin shortly after last weekend’s elections. If Erdogan proceeds with his plan, Pompeo will undoubtedly give the military the go-ahead for retaliatory attacks on the Turkish Army. This will either lead to a speedy retreat by Turkey or asymmetrical strikes on US strategic assets across the region. In any event, the fracas with Turkey is bound to widen the chasm between the two former allies forcing Erdogan to reconsider his commitment to the western alliance. Any further deterioration in relations between the US and Turkey could result in a dramatic shift in the global balance of power. Washington’s problems with Erdogan began years before the current dust-up. The Turkish leader has always steered an independent foreign policy which has been a constant source of frustration for the White House. During the war in Iraq, Erdogan refused to allow the US to use Turkish air bases to conduct their operations. (Erdogan did not support the war.) Presently he is purchasing air defense systems from Russia (S-400), (which VP Mike Pence has strongly condemned), he has attended summits in Sochi with Moscow and Tehran in order to find a political settlement for the war in Syria, he has signed contracts with Gazprom that will make his country the energy hub of southern Europe, and he has been harshly critical of US support for the its Kurdish proxies in east Syria (the SDF) which is an offshoot of the Kurdish Workers Party (PKK), a group that is on the US State Department’s list of terrorist organizations. “A Turkish newspaper reported that an American academic and former State Department official had helped orchestrate a violent conspiracy to topple the Turkish government from a fancy hotel on an island in the Sea of Marmara, near Istanbul. The same newspaper, in a front-page headline, flat-out said the United States had tried to assassinate President Recep Tayyip Erdogan on the night of the failed coup. When another pro-government newspaper asked Turks in a recent poll conducted on Twitter which part of the United States government had supported the coup plotters, the C.I.A. came in first, with 69 percent, and the White House was a distant second, with 20 percent. Let’s cut to the chase: Was the United States behind the plot to remove Erdogan from office in 2016? Probably, just as the United States was behind more than 50 other regime change operations since the end of WW2. And is the US currently harboring the mastermind of the Turkish junta in a sprawling compound in rural Pennsylvania? Yes, this is probably true as well. But, even though Turkey has provided the US with mountains of evidence identifying Gulen as the coup-leader, and even though Turkey has cooperated in the extradition of numerous terror suspects sought by the United States, the US simply doesn’t feel any obligation to return the favor by treating Turkey with respect and fairness. Why is that? Why is there one standard for the United States and a completely different standard for everyone else? Erdogan has repeatedly asked the Trump administration to respect Turkey’s legitimate security concerns by removing terrorist-linked militants (YPG) from the area around Turkey’s southern border. In mid December, Trump discussed the issue with Erdogan over the phone and agreed to meet the Turkish president’s requests. Four days later (December 19) Trump announced that all US troops would be withdrawn from Syria within 30 days. Since then, the administration has failed to meet any of its prior commitments. It has increased its troop levels in east Syria, bolstered its military hardware and weaponry, and reinforced its positions along the border. The US has also failed to fulfill its obligations under the terms of the Manbij Roadmap which requires the US to remove all YPG fighters in and around the city and assist Turkey in establishing security in Manbij. There has been no movement on this front at all. If anything, the situation has gotten worse. This suggests that the Trump team has no intention of lifting a finger to address Turkey’s security concerns or of following through on its clearly stated commitments. It suggests that Washington is actually trying to provoke Erdogan in taking matters into his own hands and doing something that he might later regret. Syria: 4000 Syrian refugees have left US-run Rukban concentration camp so far. Half of them are back in their rehabilitated towns in Homs province. Russian Centre for Reconciliation: Since February 19, 2019, in total 3,642 people have left the Rukban camp for the territories controlled by the Syrian government. Last edited by goldenequity; 04-15-2019 at 03:29 AM. 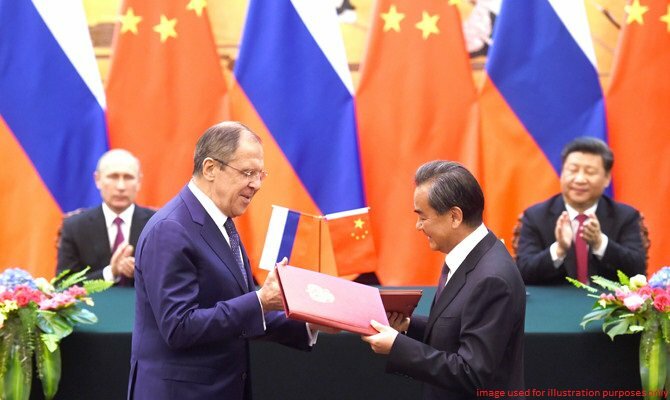 Lavrov: Russian-Chinese cooperation is mutually beneficial and comprehensive. It also has a sobering effect on those who push ahead with illegal methods of solving international problems. Some reports from Damascus are claiming the SDF, backed the the US, is preparing for an offensive to expel Iranians from Albukamal. These reports claim the US is trying to prevent Iran from having access to the international highway that links Albukamal and Al-Qa’im in Iraq. Syrian political sources revealed that the Russian delegation meeting today with President Bashar al-Assad came on Saudi initiative. The Russian delegation said to President Assad that the atmosphere in Riyadh is very positive towards the Syrian leadership.